The castle was built in the first third of the 15th century to protect a nearby road. It had not been mentioned before 1470 when the king Matej Korvín allowed to rebuild the smaller castle Roháč to a true castle. It means that there had already been a fortified object serving for watching and patrolling its vicinity before 1470. The first reconstruction, possibly influenced by Italian architects, was finished in the same year. The castle was burnt down in 1550. Later on, it was rebuilt in full extent since the terrain did not allow to build any extensions. It was also reconstructed under the reign of Katarína Bošániová but Žigmund Sirmiensis-Súľovský expressed his discontent with the state of the castle in 1703. In 1730, troops still stayed at the castle, hence it complied with its defensive function. The necessary reconstruction of the castle did not take place because of disagreements within the family of Sirmiensis. It is possible that the true reason was the fact that they lived in comfortable mansions in the village. The last family member lived at the castle in 1739, together with a watchman, who had a role of a gamekeeper, too. The family members split their possessions between the years 1752 and 1759 and the object has not been inhabited since then. The castle has not been guarded since 1780 and nobody has looked after it. The object was severely damaged by an earthquake in 1780 (the inventory of monuments incorrectly states the year 1763). The castle has not been repaired since then and went to ruins. Meanwhile, the object burned down and only few peaces of brickwork remained on the rock. The castle was build between three massive rocks. It can be seen on the ruins how the foundations were adapted to the terrain. The castle site consists of the upper and lower castle, which are roughly 25 meters apart from each other. The altitude difference between the first floor of the upper castle and the lower castle level is 14 meters. The height of the ruin is approximately 18 meters. The lower castle is actually a defensive bastion (5×10 meters) with several floors. A room on the ground floor has four well distinguishable windows and it probably had eight loopholes. The walls are 80-120 cm thick. A very narrow hole in the rock, which scarcely allows a person to go through, serves as the only entrance to the upper castle. It is also secured by a drawbridge. There were likely 18 rooms with arches in the upper castle. Its walls are 80-100 cm thick. There was a steep staircase carved out of rock. A water tank (80×150 cm) is situated in the upper castle but it is filled up with waste and debris. The uppermost part of the whole castle was used as a watch-tower with an excellent view of the vicinity. 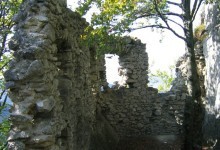 The preserved part of the castle includes the foundations, some traces of beams and anchors, arches carved out of rock and tiny remains of the walls with holes for windows. The ruins of the lower castle show a part of the palace with a vantage point. The entrance to the castle with a loophole and an artificial rock gorge in front of the entrance are noticeable, too. The middle palace in the upper castle shows an arch and some traces of the staircase, that are supported by ruins of a rock pylon. There is also a hole in the wall with an iron ladder leading to the uppermost part of the castle, where some ruins of the water tank and the tower can be noticed.